THE GOOD: The Honda Odyssey’s performance and efficiency are quite good for a minivan. Dashboard tech has been overhauled and now features Android Auto, Apple CarPlay and a physical volume knob! Cabin Watch and Cabin Talk help parents keep tabs on a car full of kids without taking their eyes off of the road, and rear entertainment apps help keep little passengers occupied. THE BAD: The Odyssey’s heavy second-row seats don’t remove easily or stow and go. The 10-speed automatic transmission may have too many ratios; it’s always shifting. THE BOTTOM LINE: The 2018 Honda Odyssey is solid choice for modern families with a smart loadout of available driver aid, infotainment and family-friendly tech. Plus, it’s a pretty fun drive — for a minivan. The 2018 Honda Odyssey’s fifth-generation redesign looks a lot like the previous generation and boasts a similar footprint. Though it hasn’t grown in scale, the minivan is now stronger and smarter. The 3.5-liter V-6 engine beneath the hood is now 32 horsepower stronger, bringing the peak output to a healthy 280 ponies thanks to the addition of direct injection technology and other tweaks, which makes for better acceleration, passing and hill-climbing. A new standard nine-speed transmission (or a 10-speed unit for Touring and Elite models) keeps the fuel economy in line with the previous generation at 22 mpg combined. That’s 19 mpg in the city and 28 highway mpg. I averaged 21.8 mpg during testing on our San Francisco home turf. With so many gears, it seems the Odyssey is always shifting, but the changes are smooth and I almost never ran into a situation where it seemed to be “hunting” around for the right ratio. Meanwhile, a redesigned rear suspension helps to better soak up bumps while also adding a helping of sure-footedness to the rear end, freeing up a bit of space for cargo and quieting the ride a bit. In fact, the Odyssey rides significantly quieter at highway speeds thanks also to additional sound damping material about the chassis, the optional acoustic side glass of the upper trim levels and 10-speed powertrain’s ability to cruise at very low RPMs. As welcome as the performance bump may be, people tend not to buy minivans based on horsepower. Thankfully the 2018 Honda Odyssey Elite that I recently found myself piloting is also packed to the gills with family-friendly technologies and features that are sure to boost its already strong appeal. Just aft of the driver’s seat and mounted to the ceiling is the new centerpiece for Honda’s child- and passenger-friendly technology: A new rear-seat entertainment system that swings down from the roof. This 10.2-inch system can play video from a Blu-ray disc player on the front row, an HDMI input on the center console or from a variety of onboard media streaming apps such as PBS Kids. These apps are powered by the onboard 4G LTE data connection that is also used to connect up to seven portable Wi-Fi devices. The rear entertainment’s newest trick is an onboard app called “How much further?”, an animated ETA display that interfaces with the navigation to give kids a fun way to track trips. It’s a lot like the Chrysler Pacifica‘s “Are we there yet?” app in function and scope. Android devices (and soon iOS products) connected to Wi-Fi can take advantage of a new Cabin Control app that, well, gives passengers limited control of various in-cabin functions. Through the app, they can add and stream music through the audio system to a community playlist, adjust the rear-zone of the climate control system, search and suggest destinations for navigation or remotely control the rear entertainment. Of course, the driver has final say over volume, accepting the destinations and so forth, so the kids can’t get out of control. To keep those portable devices charged there are up to three high-power (2.5A) USB ports scattered around the cabin, multiple 12-volt power points and a 110-volt inverter beneath the dashboard. In addition to the kid-friendly tech out back, there’s a new gamut of features and technologies up front to help keep moms and dads happy and safe while motoring along. The focal point of most of these functions is a new infotainment system that — hallelujah! — now features a physical volume knob. The framework is still based on the Android operating system, but with new software on top and new hardware beneath. Honda tells me that it’s the company’s fastest and most responsive infotainment system yet. And after hours tinkering with it, I can confirm that it is indeed snappy. Navigation duties are still handled by Garmin maps and routing software and you can still bring your own maps to the party with standard Android Auto and Apple CarPlay USB connectivity. In addition to sharper more responsive versions of the functions that we saw implemented on the Ridgeline and Pilot vehicles, the new infotainment system gains a pair of new features to help parents keep an eye on their precious cargo. Cabin Watch uses a wide angle lens mounted to the ceiling to let the driver and front seat passenger keep an eye on the second and third row seats. Subtle infrared lights mean that Cabin Watch can even see in the dark and pinch-to-zoom functionality on the dashboard display allows a parent to, for example, zoom in on just a car seat they’re interested in. Think of it as an eye-in-the-sky that lets you see almost everything in the rear cabin without twisting around and looking away from the road. A compliment to Cabin Watch is Cabin Talk, which Honda’s representatives affectionately called the Voice of God. Cabin Talk uses microphones in the front roof console to amplify and project the driver’s voice through the cabin speakers or the rear seat entertainment headphones at the touch of a button. This means that a parent in the front seat doesn’t need to turn around to address the kids out back and doesn’t even need to raise their voice. This works similar to a feature I saw debuted on the Toyota Highlander a few years ago, but a bit louder and better defined. Rounding out the available technology is the optional Honda Sensing driver aid suite. Check this option box when speccing an Odyssey to add lane-departure warnings and lane-keeping assisted steering. These features notify the driver when the minivan drifts out of its lane and apply a steering aid to guide it back between the lines. Honda Sensing also includes forward-collision warning with autonomous emergency braking and adaptive cruise control. Blind spot monitoring, rear cross traffic alert and a rear camera round out the active and passive driver aid technologies available. The flanks of the Odyssey Elite feature dual-power sliding doors which can be opened or closed remotely with the key fob, from the front seat with a toggle or from the rear cabin with a firm tug of either handle. Honda has improved the opening and closing logic to prevent multiple inputs from cancelling each other out. So, if a kid pulls the handle while mom or dad are tapping the release button, the system will know you want it to open up and won’t get stuck stuttering. Just beyond those power doors are the new Magic Slide second-row seats, which can slide from left to right independently with the pull of a lever. This makes it easy to access the third row when loading passengers or just allows parents to push together or separate siblings. A removable seat section can be popped between the buckets increasing the total number of seats from 7 to 8. The third row features Honda’s Magic Stow seats that fold and flip away with a firm tug of one strap, presenting a flat cargo floor for loading bulky items. The stowing process is easy enough to do with one hand. There’s room aplenty with just the third row stowed, but the Magic second row seats can be removed if you need more. However, the process is so awkward and the seats so heavy that it discourages the practice. If you carry cargo as often as you do children, perhaps Chrysler’s Stow-N-Go seats are a better lifestyle fit. The quality of life amenities are punctuated by a power liftgate out back with a kick-to-open handsfree functionality and the optional HondaVac vacuum cleaner by ShopVac that is integrated into the rear cargo area. It features a removable canister, a stretching hose that reaches the entire cabin and a couple of attachments for cleaning crevices and carpet. The minivan wars are heating up again with the emergence of the new and award-winning Chrysler Pacifica and Pacifica Hybrid. 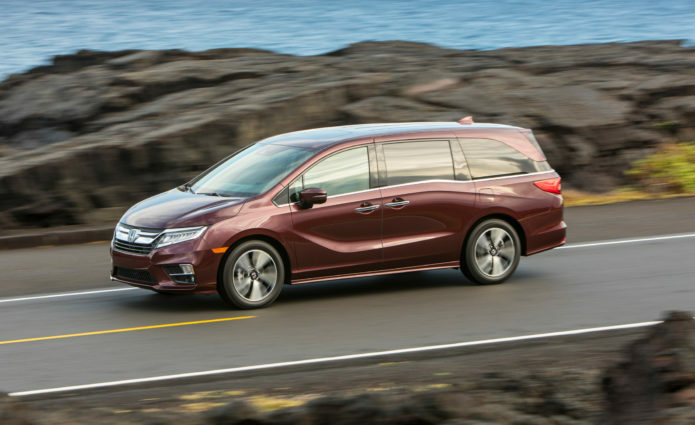 Not content to let its bestselling minivan languish, the Honda empire strikes back with a solid fifth-generation Odyssey, but will it be enough to retain its top spot? We’ll have a better idea once we can spend more time with the Odyssey. The 2018 Honda Odyssey starts arriving in dealerships soon with pricing ranging from $29,990 for the base LX model to a lofty $46,670 for the loaded-up Elite trim level that I was able to test.